What is the Keller Funnel No-Touch Technique? The Keller Funnel is a specialized polymer sleeve used to insert implants of all types into the body without actually having to touch the implant or expose it to potential contaminants on the skin surface, the operative field, or from the air. The sleeve allows the implant to be transferred directly from it’s sterile container through the incision with minimal exposure to it’s surroundings, and also allows for a near-frictionless insertion that minimizes stress on the implant and the incision. The No-Touch Technique using the Keller Funnel for breast augmentation is quickly becoming the gold standard for sterility and safety, and we are proud to offer this technique to our exclusive breast augmentation clientele. 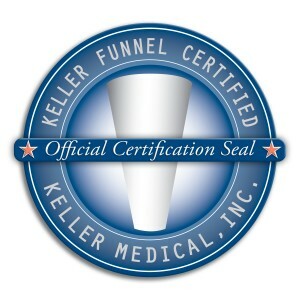 Keep reading for more information and a video demonstration of the Keller Funnel in action. Why is the No-Touch Technique important for breast augmentation surgery? Increased Sterility. Since the funnel serves as a conduit for the implant to pass directly from the sterile manufacturer’s container into the body, the implant is significantly less exposed to the surroundings and possible contaminants. Reduced risk of infection. Since the implant is less exposed to possible contaminants when using the funnel, the risk of infection is reduced. Reduced risk of capsular contracture. Because the risk of implant contamination and infection is reduced using the No-Touch Technique, the risk of capsular contracture is also theoretically reduced. Less trauma to the implant. The nearly frictionless lining of the funnel ensures the smoothest, lest traumatic passage of the implant, and minimizes the chance of gel fracture or damage to the shell. Less trauma to the incision. The finger method of insertion places a great deal of stretch on the incision with can damage the micro collagen structure enough to potentially change the way the final scar will heal, but the No-Touch Technique minimizes the amount of stretch on the tissue with much less collagen damage and a better final scar appearance. Smaller incision and smaller scar. Most incisions can be made about 1-2cm smaller with the funnel, and in these cases, the final scar will also be smaller by the same amount. Less pain and discomfort. Because the implant goes in faster and more smoothly with less trauma and stretch injury, the level of discomfort after surgery is also decreased. How does the Keller Funnel No-Touch Technique compare to traditional finger methods of implant insertion? Finger method takes much longer. The finger method can take up to 10 minutes longer in some cases, especially when large size, textured surface, or gummy bear implants are used. Finger method places more stress on the implant and the incision. The implant is deformed and stretched to a much greater degree with the finger method as opposed to the smooth, gentle insertion with the funnel. Finger method exposes the implant to contaminants for a longer period of time. The implant is exposed to possible contaminants for a much longer period of time when being inserted with the finger technique, and is also exposed to a much higher degree of contact to the surgeon’s hands and to the patient’s skin during the finger insertion technique. The funnel minimizes all of these possible contamination sources. Can the Keller Funnel No-Touch Technique be used for other types of breast implant procedures? Yes, we use the Keller Funnel No-Touch Technique for nearly all of our breast implant procedures like breast implant revision/exchange and mastopexy augmentation (breast lift with implants). We are one of the few practices in the world that focuses almost exclusively on breast augmentation surgery, and our results match our commitment to producing top-notch results with the least amount of downtime and the most predictable outcomes. We’re looking forward to meeting you for your consultation, and to adding you to our ever-expanding list of women who got better results than they ever imagined with one of our exclusive and innovative techniques. We encourage you to View our Breast Augmentation Photo Gallery to see the incredible results that real patients have achieved in our practice with our exclusive and innovative approach to breast augmentation surgery. For more information about the No-Touch Breast Augmentation using the Keller Funnel, please call our office at 917-703-7069, or send us a message by clicking here. We offer the most innovative techniques and the quickest recovery times in the safest environment possible.